Operators of Set Jet believe they’ve created a model for corporate air travel that will appeal to San Diegans who are put off by crowded and time-consuming commercial flights and the prohibitive costs – for many – of private aviation, such as chartered flights or aircraft ownership. Scottsdale, Ariz.-based Set Jet, started in 2010 and led by the co-founder of Taser International Inc., recently debuted its membership-based service at San Diego International Airport’s general-aviation facility. It enables pre-cleared travelers to arrive minutes before a flight and get to their destination city in about an hour – for a one-way price of about $350 to $400. 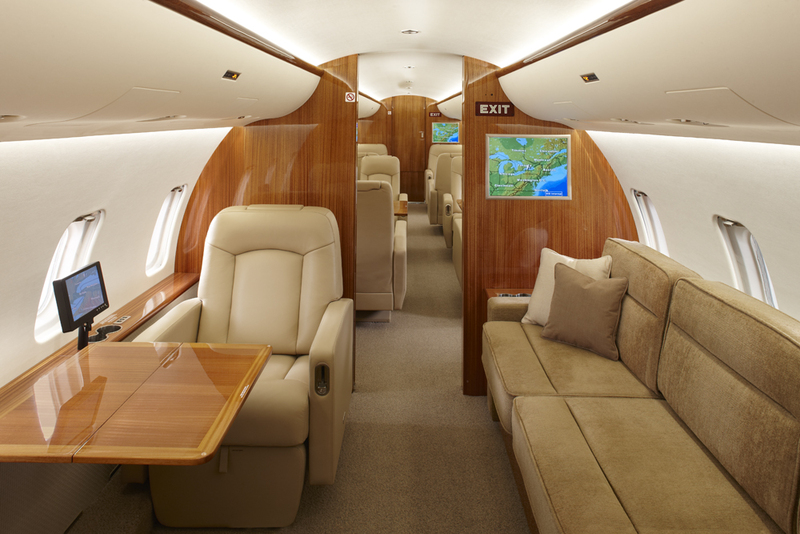 Set Jet charges a $100 monthly membership fee and uses Bombardier CRJ200 jets, which are typically configured to seat 50 passengers but have been converted to 15-seaters with amenities such as plush reclining chairs, sofas and conference tables. CEO Tom Smith said his service is the nation’s first, or at least among the first, to be operated on a membership basis. He’s looking to expand it to other regions as it gains traction in its current Western cities. Smith has spoken in recent years with fellow executives who talked about becoming weary, in the post 9/11 era, of long waits in security lines, increasing baggage and booking fees, and overstuffed overhead bins on flights that rarely fly at less than full capacity on the major commercial carriers. “It’s really for people who don’t want their time taken up by what’s necessary to fly commercial these days, “ said Smith, a longtime pilot who launched his latest venture after retiring from the Taser electroshock-gun company that he co-founded with brother Rick in the early 1990s. The Bombardier CRJ200 jets, which are typically configured to seat 50 passengers, have been converted to 15-seaters for Set Jet. Prior to launching in San Diego, Set Jet began offering its membership-based service to Los Angeles International Airport and smaller airports in Van Nuys, Burbank and Orange County, along with its home base at Scottsdale Airpark. Set Jet operates its service under contract with jet operator Maine Aviation Corp., which employs two pilots per flight, while Set Jet employs an on-board-hostess. In the first month after the mid-September San Diego launch, Set Jet ran about 24 local flights on two planes, carrying three passengers per flight on average, Smith said. Customers have included time-strapped corporate executives, doctors and lawyers. “Over the years, I had run into several lawyers whose clients were complaining about being billed for five or six or seven hours travel time, because the meter starts running when they leave for the airport,“ Smith said. While he’s looking to expand to other regions in the long term, Smith said the service is currently limited to destinations that can be reached within 60 to 90 minutes of each other. Members who call ahead can arrive as little as 10 to 15 minutes before a flight takes off, with take-off times chosen by the first party that books a particular flight. While it’s too early to declare it a threat to traditional airlines, some observers say ongoing shifts in the commercial carriers’ business model could spur some frequent corporate travelers to seek alternatives like member-based air travel. “You will probably be seeing more services being offered by these innovative smaller airlines, catering to people who are not necessarily price-sensitive but more service sensitive,” said Bijan Vasigh, a business professor at Embry-Riddle Aeronautical University in Florida. As niche services gain traction, he said the cost to operate jets like the CRJ200 – around $1500 to $2000 per hour – should be spread among more passengers, enabling carriers to keep prices down and be profitable. Niche carriers in the U.S. also use smaller satellite airports that are increasingly being bypassed by larger commercial carriers as they continue to reduce routes amid industry consolidation, Vasigh said. Demand for such services could be stoked by an expected nationwide increase in corporate trips, barring negative impacts from current budget showdowns in Washington, D.C. Spending on corporate travel in the U.S. is expected to rise 7.2 percent in 2014, reaching $288.8 billion and reversing a decline seen in 2013, the Global Business Travel Association said recently. Set Jet CEO Tom Smith helped create the private aviation company’s business model with an eye on saving corporate air travelers’ time. Set Jet started with about one flight per week and has increased operation to two or three weekly flights, said Carrie Campbell, General Manager at the San Diego location of Fixed-Based Operator Landmark Aviation, where the new carrier’s flights originate. Landmark recently broke ground on a $39 million FBO facility on the north side of Lindberg Field, set to open next year with a 20,000-square-foot terminal, a 250,000-square-foot ramp and five hangars on 12.4 acres. Campbell said “transient” travel at the current facility – by small aircraft not based at Landmark – has remained flat over the past year, but generally has been improving since the recession ended. Part-time San Diego resident Lawrence Shaw, a plastic surgeon with a practice in Scottsdale, recently used Set Jet to attend an industry conference at the San Diego Convention Center. He arranged the flight on short notice and arrived minutes before taking off in Scottsdale. His one-way cost was about $400, he said, well below the $3,500 to $5,000 that he has seen quoted for similar private charter VIP flights. “I think [Set Jet is] potentially going to make private air travel available to a larger portion of the population,” Shaw said.